Dr. F. Karach popularised this procedure as oil pulling. He claimed that oil pulling can cure several illnesses including oral diseases, but his claims were not supported by evidence. Recent studies of oil pulling therapy using sunflower oil  and sesame oil  were found to decrease plaque induced gingivitis. Even though coconut oil is used for gargling among the people in coconut farming communities, no studies have been done on the benefits of oil pulling using coconut oil, to date. Therefore a study was conducted to assess the effect of coconut oil on plaque formation and plaque related gingivitis. The aim of the study was to evaluate the effect of coconut oil pulling/oil swishing on plaque formation and to evaluate the effect on plaque induced gingivitis. A prospective interventional study was carried out. A total of 60 age matched subjects in the age-group of 16-18 years with plaque induced gingivitis were included in the study. Informed consent was taken for their inclusion in the study. The use of systemic or topical antibiotics and the history of dental treatment in the past one month were set as exclusion criteria. All the subjects were recruited into a single group. There was no control group in the study. The study was designed to compare the baseline values and the post intervention values in a single group performing coconut oil pulling in addition to their oral hygiene routine. A thorough history regarding the medical condition and the medication taken in the past 6 months was obtained from the subjects. The oral hygiene habits of all the subjects were recorded in detail. All the chosen subjects had a habit of brushing once or twice a day with toothbrush and paste. Six subjects had the habit of flossing once in the night along with brushing twice a day. The subjects were advised to routinely perform oil pulling with coconut oil every day in the morning in addition to their oral hygiene routine. Five subjects discontinued from the study as they could not tolerate the taste of the oil and three subjects discontinued from the study because of antibiotic usage during the period. Modified Gingival Index  and Plaque Index  were used as the clinical measures to assess gingival inflammation and plaque formation respectively. The clinical examination was performed by two independent observers. All subjects were assessed around 4 hrs after performing oil pulling. Plaque and gingival indices were measured at baseline that is, and on days 1, 7, 15, 30 after the oil pulling routine was started. The final scores were statistically analyzed using the students paired t test. Interobserver agreement was measured using the kappa coefficient. Reliability of clinical examination was tested for all the days of assessment and the interexaminer reliability was found to be substantial to good. The Kappa coefficient scores were in the range of 65-92 [Table 1]a and b]. The mean gingival index was 0.91 and the plaque index was 1.19 at baseline. In comparison to the baseline values both the gingival and the plaque indices substantially reduced during the period of assessment. There was a steady decline in both the plaque index and the gingival index values from day 7. 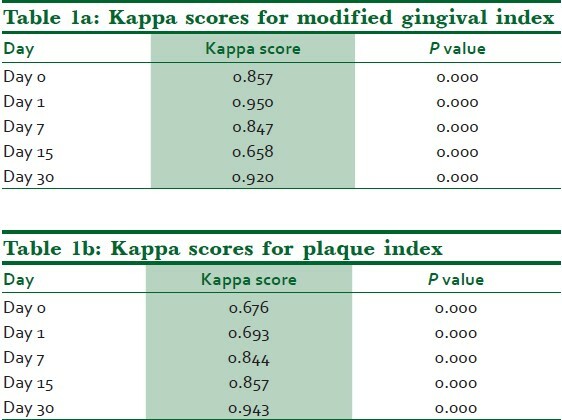 The average gingival index score on day 30 was down to 0.401 and the plaque index score was 0.385 [Figure 1] and [Figure 2]. Statistical analysis using the paired t test showed that the decrease was statistically significant [Table 2] and [Table 3]. Oral hygiene measures using chemo mechanical procedures reduce the incidence of plaque related diseases by decreasing the plaque accumulation. Our study aimed at checking the effectiveness of oil pulling with coconut oil as an adjuvant to brushing, in decreasing the plaque accumulation and plaque induced gingivitis. Plaque Index by Sillness and Loe  and Modified Gingival Index  were used for clinical assessment in the study as they are the most widely used indices in trials for therapeutic agents. Oil pulling with sunflower oil was found to significantly reduce plaque index and gingival index after 45 days. Asokan et al., found oil pulling therapy with sesame oil was equally effective as chlorhexidine in decreasing plaque induced gingivitis. In our study also there was a significant decrease in the plaque and the gingival index at the end of 30 days. 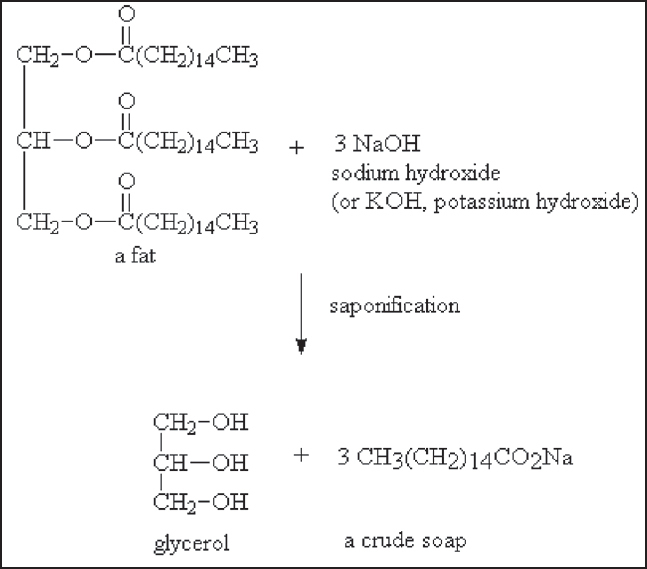 It was also proposed that the alkalis in the saliva can react with the oil leading to saponification and formation of a soap like substance [Figure 3] which can reduce the adhesion of plaque. , Coconut oil has a high saponification value and is one of the most commonly used oil in making soaps. The soaps produced with coconut oil can lather well and have an increased cleansing action. The lauric acid in the coconut oil can easily react with sodium hydroxide in saliva during oil pulling to form sodium laureate, the main constituent of soap  which might be responsible for the cleansing action and decreased plaque accumulation. There are many commercially available mouthwashes. Chlorhexidine containing mouthwashes have been found to be the most effective among them. Listerine (phenol compound) and Meridol (an amine/stannous fluoride mouthwash) were found to be less efficacious than Chlorhexidine in controlling plaque induced gingivitis. (Listerine) and (Meridol). After 3 weeks of rinsing, plaque indices remained the lowest in the chlorhexidine group, while subjects using Listerine or Meridol the score were similar but significantly lower than that of individuals rinsing with the placebo solution. The antimicrobial potential of chlorhexidine was found to be the highest followed by Meridol. In our study there was a 50% decrease in the plaque and gingival index scores in 4 weeks which is comparable to the decrease produced by chlorhexidine. Chlorhexidine on long term use alters taste sensation and produces brown staining on the teeth which is very difficult to remove. The mucous membranes and the tongue can also be affected and may be related to the precipitation of chromogenic dietary factors on to the teeth and mucous membranes. Staining is also associated with the of long term use of Phenol compound and stannous fluoride containing mouth washes. In the present study there were no reported alterations in the taste or noticeable staining from coconut oil at the end of 4 weeks. Studies show that coconut oil also has substantial antimicrobial activity. This is attributed to the presence of monolaurin in coconut oil. It is shown to have significant antimicrobial activity against Escherichia More Details vulneris, Enterobcater spp., Helicobacter pylori, Staphylococcus aureus, Candida spp., including C. albicans, C. glabrata, C. tropicalis, C. parapsilosis, C. stellatoidea and C. krusei, Studies also show that coconut oil is affective against S. mutans and C. albicans in an in vitro oral biofilm model. The antimicrobial potency of coconut oil was not tested in our study. Further studies with a have been planned to check the antimicrobial potential of coconut oil. The fact that a control group with a proven chemotherapeutic agent was not used is the major the limitation of our study. Oil pulling has been proven to be an effective method in reducing plaque formation and plaque induced gingivitis. This preliminary study shows that coconut oil is an easily usable, safe and cost effective agent with minimal side effects which can be used as an adjuvant in oral hygiene maintenance. More studies on the antimicrobial potency of coconut oil on microorganisms causing oral diseases is required to authenticate the use of coconut oil as an effective oral antimicrobial agent. Further studies on coconut oil with a large number of subjects and comparative studies using various chemotherapeutic agents can improve the quality of evidence. Mandel ID. Chemotherapeutic agents for controlling plaque and gingivitis. J Clin Periodontol 1998;15:488-98. Bruce Fife MD. The healing miracle of coconut oil. Piccadilly Books Ltd. 1 [st] edition. Health Colorado Springs: Wise publications Co; 2000. p. 1-46. DebMandal M, Mandal S. Coconut (Cocos nucifera L: Arecaceae): In health promotion and disease prevention Asian Pac J Trop Med 2011;4:241-7. Ogbolu DO, Oni AA, Daini OA, Oloko AP. In vitro antimicrobial properties of coconut oil on Candida species in Ibadan, Nigeria. J Med Food 2007;10:384-7. Pehowick DJ, Gomes AV, Barnes JA. Fatty acid composition and possible health effects of coconut constituents. West Indian Med J 2000;49:128-33. Newman MG, Takei HH, Klokkervold PR. Carranza's Clinical Periodontology. 10 [th] edition. Elsevier; 2006. p. 241. Marsh PD. Dental plaque: Biological significance of a biofilm and community life-style. J Clin Periodontol 2005;32:7-15. Ciancio SG. Current status of indices of gingivitis. J Clin Periodontol 1986;13:375-8. Alsberg CL, Taylor AE. The Fats and Oils - A General Overview (Fats and Oils Studies No. 1). Stanford University Press; 1928. p. 86. Pavia DL, Lampman GM, Kriz GS, Engel RG. Introduction to Organic Laboratory Techniques: A Small Scale Approach. Brooks/Cole Laboratotory series for organic chemistry. 2 [nd] edition; 2004. p. 252-65. Agero AL, Verallo-Rowell VM. 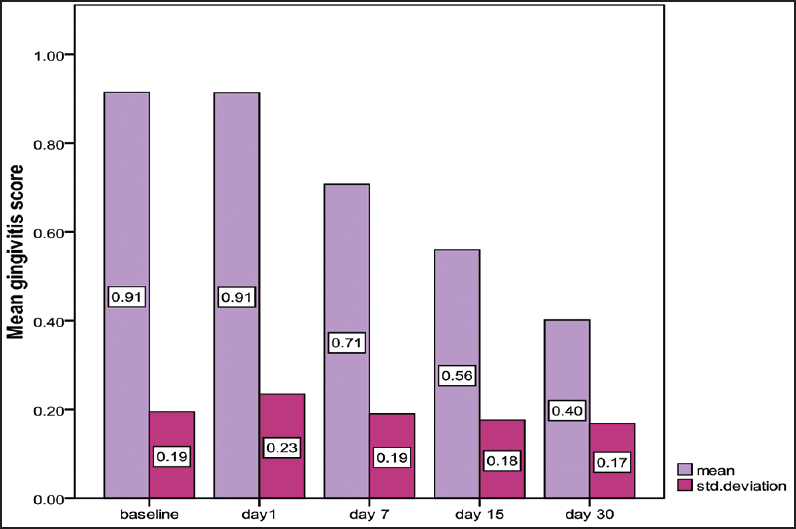 A randomized double-blind controlled trial comparing extra virgin coconut oil with mineral oil as a moisturizer for mild to moderate xerosis. Dermatitis 2004;15:109-16. Brecx M, Brownsfone E, MacDonald L, Gelskey S, Cheang M. Efficacy of Listerine®, Meridol® and chlorhexidine mouthrinses as supplements to regular tooth-cleaning measures. J Clin Periodontol 1992;19:202-7. Leard A, Addy M. The propensity of different brands of tea and coffee to cause staining associated with chlorhexidine. J Clin Periodontol 1997;24:115-8. Brecx M, Macdonald LL, Legary K, Cheang M, Forgay MG. Long-term Effects of Meridol® and chlorhexidine mouthrinses on plaque, gingivitis, staining, and bacterial vitality. J Dent Res 1993;72:1194-7. Hennessy T. Some antibacterial properties of chlorhexidine. J Periodont Res 1973;8:61-7. Emisilon CG. Susceptibility of various microorganisms to chlorhexidine. Scand J Dent Res 1977;85:255-65. Budtz-Jorgensen E, Löe H. Chlorhexidine as a denture disinfectant in the treatment of denture stomatitis. Scand J Dent Res 1972;80:457-64. 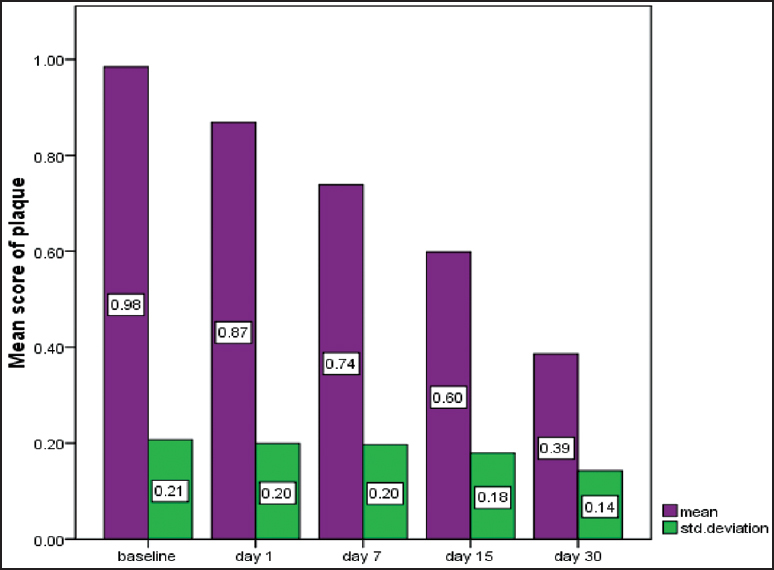 Grenier D. Effect of chlorhexidine on the adherence properties of Porphyromonas gingivalis. J Clin Periodontol 1996;23:140-2. McBain AJ, Bartolo RG, Catrenich CE, Charbonneau D, Ledder RG, Gilbert P. Effects of a chlorhexidine gluconate-containing mouthwash on the vitality and antimicrobial susceptibility of in vitro oral bacterial ecosystems. Appl Environ Microbiol 2003;69:4770-6. Thaweboon S, Nakaparksin J, Thaweboon B, Effect of oil-pulling on oral microorganisms in biofilm models. Asia J Public Health 2011;2:62-6.